…be sure to know how to get there! In less than two months the European playingCLIL conference will take place. 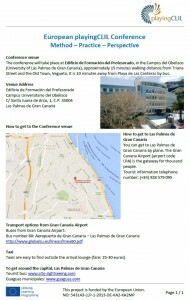 It’s time to give you some more information about the confernce venue. We prepared it all. Find attached the neccessary information about the adress, public transport and a link to Google Maps. More information with special accommodation offers will follow within the next two days. P.S. If you haven’t done yet: To register directly for the conference please follow this link!